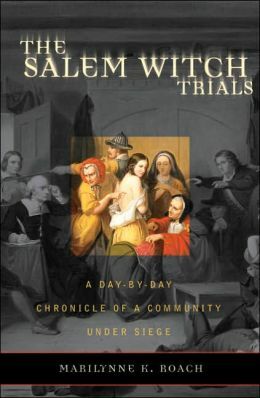 Mary Roach’s new book – The Salem Witch Trials: A Day-by-Day Chronicle of a Community Under Siege – offers a factual account of a riveting piece of history that has fostered fictional plays and novels. Roach based her nonfiction book on twenty-seven years of original archival research, including the discovery of previously unknown documents, chronicling the real drama of Salem in 1692. I usually prefer fiction to nonfiction, but having read Roach’s Packing for Mars, I look forward to her unbiased research mixed with her practical humor and cynical perspective. That said, I still prefer imagining those lives from Katherine Howe’s The Physick Book of Deliverance Dane or Deborah Harkness’ “All Souls Trilogy,” following the fictional modern trials of witch Diana Bishop (A Discovery of Witches). How true to fact does historical fiction need to be? Do you get stuck on the details that don’t quite fit (if you know them), or let the author’s poetic license weave a story that has universal appeal? Traditionally, historical fiction uses incidents that happened at least a hundred years ago. Authors expect the reader to make the connections to history, but also understand that the author is creating conversations and actions that probably did not really happen. (Going back in time to lurk under the bed of all those Elizabethan queens to hear those conversations was not an option for Philippa Gregory). The more realistic they seem, the better the book. Often a movie follows, with even more digression from the facts. Authors may offer a disclaimer that their story was inspired by an incident, a person, a place that appears in the book as an anchor, with the rest from the imagination of the writer. If the authors of historical fiction are not accurate – this is fiction, after all – do they risk misinforming the literal reader? creating alternative history? Were the reputations of Frank Lloyd Wright (Loving Frank), and, most recently, Robert Louis Stevenson (Under the Wide and Starry Sky), enhanced by Nancy Horan’s fictional imaginings to their life stories? Or, do some readers want, like the Queen in Hamlet, “More matter with less art” ? What fiction have you read based on real history? How did that work out for you? This entry was posted in American history, authors, book review, books, essays, historical fiction, history, mysteries, nonfiction, reading, writing and tagged A Discovery of Witches, Fiction, Frank Lloyd Wright, historical fiction, imagined history, Mary Roach, Physick Book of Deliverance Dane, Robert Louis Stevenson, Salem, Salem witch trials, Sarajevo. Bookmark the permalink.